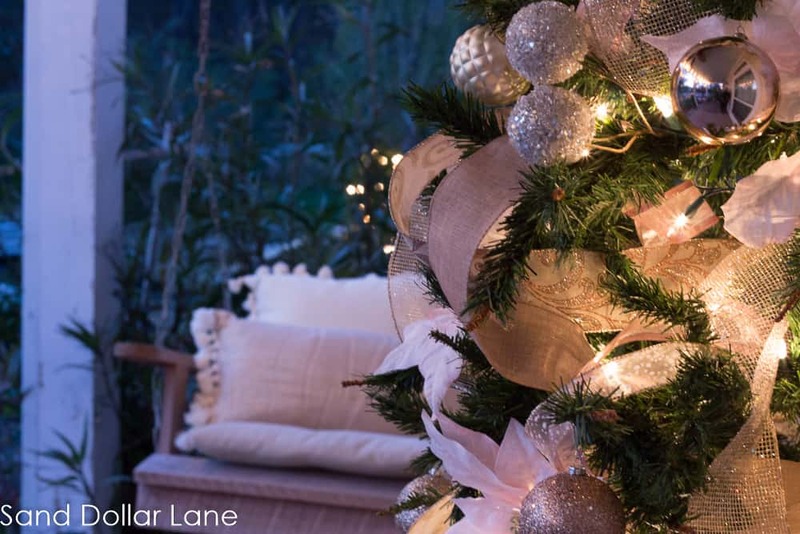 Elegant and classy, our rose gold Christmas tree is a pretty addition to our front porch Christmas decorations. Every year since we built our front porch I have decorated a full size Christmas tree for it. I love sitting out there with the lights all twinkly and pretty. This year’s rose gold Christmas tree is my favorite so far! All the metallic colors and gorgeous ribbon make me so happy! This week we’re joining a group of 20 amazing home bloggers to bring you some amazing Christmas inspiration! 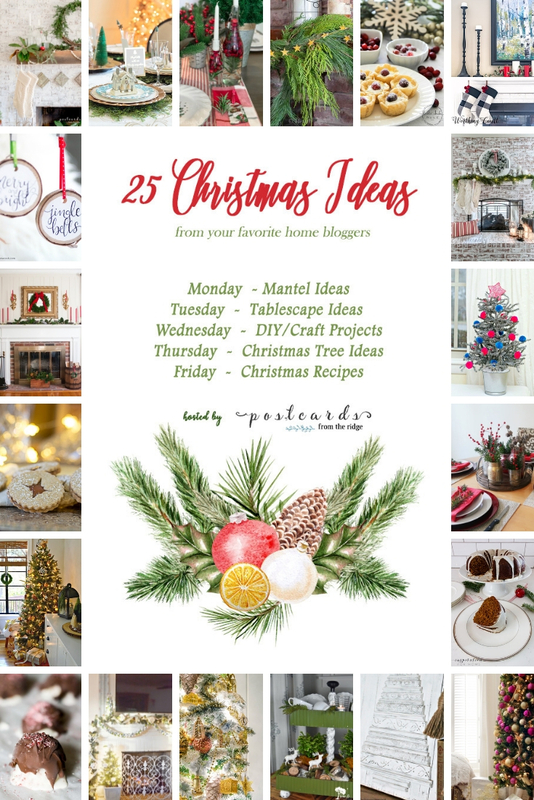 All week we’ve been sharing Christmas mantels, tablescapes, DIY gift ideas, Christmas trees and Christmas recipes! Be sure to check out all the other posts at the bottom of this post. A huge thank you to Angie from Postcards from the Ridge for coordinating this fun group! All the ribbon, garland, flowers, ornaments and fillers are from Michaels. Gotta love one stop shopping! 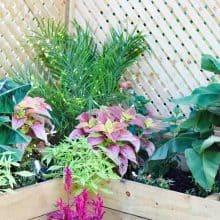 I used the same ribbon and ornaments on our evergreen planters at the beginning of the path to our doors. The pink poinsettia flowers break up the neutral colors and give our rose gold tree a subtle pop of color. It’s less expensive to buy them in a bush (faux) than in single stems. It’s super easy to use wire cutters to make them into single stems. 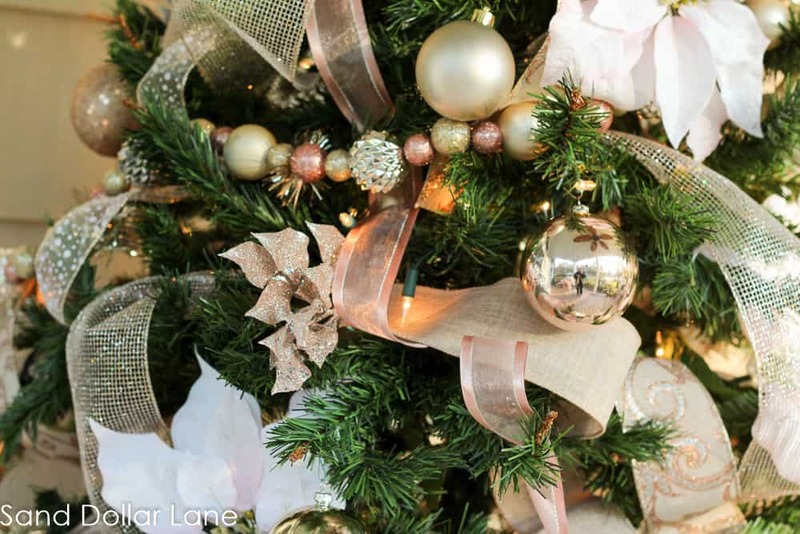 I can’t wait to show you the rest of our rose gold Christmas decorations on the front porch next week but in the meantime, it’s time to see all the Christmas ideas from these talented home bloggers. Here’s the tour lineup for the week. Be sure to visit everyone for wonderful Christmas ideas for the whole house. The links for each topic are below the images. 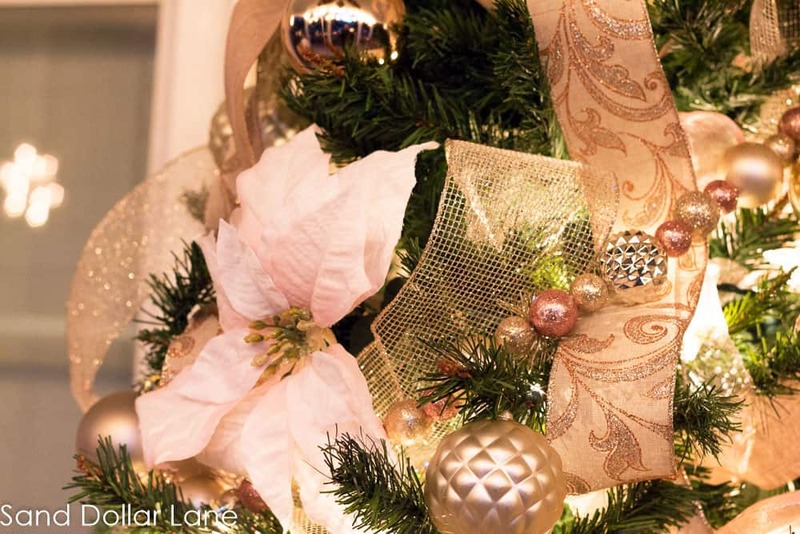 Eileen, I adore your rose gold Christmas tree! Especially the pink poinsettias and that sparkly bead garland. It must be really special to have that greeting you on the porch every day. Thanks for joining the tour! Can’t wait to see the rest of your decor. Thanks so much Angie! I love these soft colors right now. Really enjoyed being part of this fun tour! That rose gold is such a pretty color. It reminds me of my Black Hills gold ring I got when I was 16 instead of a class ring. I especially love the garland you’ve got on the tree. And yes…I’ve figured out the trick of just buying a bush and cutting it up, too! Good tip! I love rose gold, it’s so soft and pretty! I bet your ring was gorgeous! Thanks Susie! We think alike, the ribbon was my favorite part. I love it! I love that you have a fully decorated tree on your porch to enjoy when you drive up to your house. I’m sure that all of your visitors love it as well. The rose gold color scheme that you used is so pretty! Your tree is so pretty, I love that you have a decorated tree on your porch! The pink poinsettias have to be my favorite. What a stunning tree!! Merry Christmas to you and yours. 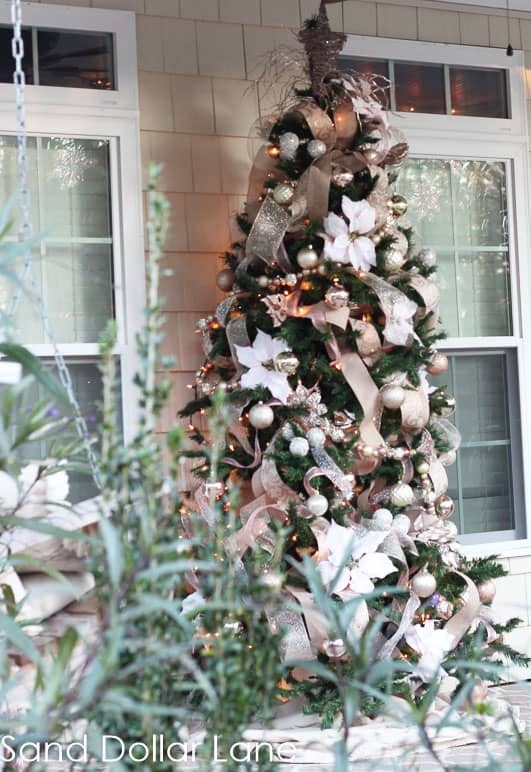 What an elegant Christmas tree … and I love that it’s on your front porch! 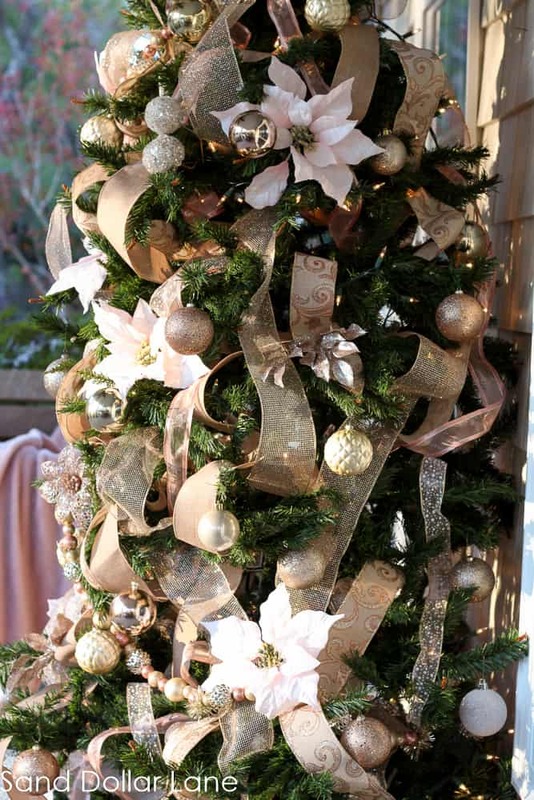 So pretty – love the rose gold and the giant white poinsettias.